In-play has enjoyed a tremendous surge in popularity since introduction, and now encapsulates such a huge chunk of many revenue streams. As in-play grows, however, so does the need for personalised, relevant real-time player engagement, which can be so instrumental with regards to those all important retention figures. This is one such area OtherLevels are to address as part of the ‘Innovation and Technology Track’ at next week’s Betting on Sports Conference (18-21 September), in a presentation titled “innovation in real-time player engagement through smart automation and behavioural profiling”. Ahead of that date, we spoke to Brendan O’Kane, OtherLevels’ CEO, who is to deliver the talk in conference room 3 from 11:30-12:00. SBC: What are you most looking forward to at Betting on Sports? Brendan O’Kane: It’s a great opportunity for networking with leading brands and hearing innovative presentations. We enjoy sharing new ideas and meeting new and existing customers. There’s lots of exciting things happening in the sector right now around the growth of new markets, personalisation, automation, AI and new channels. It is a great time to be discussing innovation. We attend each year and it is an important part of the gambling ecosystem. SBC: Looking at your own participation, what are you hoping to get out of the conference? BOK: Betting on Sports is always a great opportunity to discuss our learnings and experiences from working with our customers and with other industry experts. Also we are looking forward to seeing the innovations that the industry is embracing to differentiate their product from a converging market. We are constantly developing new ways to enhance our customers use of data to reach customers with relevant messaging, and we enjoy using this forum to discuss the challenges our customers face and how we can help them to overcome them. SBC: Touching upon your presentation, how important is it for players to receive relevant, personalised messages? BOK: At OtherLevels we see this as a key driver of player engagement. Without that, you will not see increased betting behaviour, and you will lose that players share of wallet to a competitor. However that is not the whole scope of messaging, customer service and player experience are also key concepts for an operator to tackle. SBC: Is too much emphasis currently being placed upon acquisition rather than retention? BOK: I don’t think this a question of acquisition vs retention which is the traditional way of looking at a marketing budget. Yes increased acquisition costs and the cost of paid media, in general, means that you can’t afford to acquire then lose new players. However, in some circumstances the acquisition of new players at all cost, without thought to how those type of players will be retained, leads to a mismatch in strategy. If you can use the data on how a customer is acquired to personalise and target their messaging throughout their player life-cycle, you can mitigate against churn and not have to use so much of your acquisition budget to re-acquire those customers you lost. SBC: What do you envisage the future of in-play will look like in 12/18 months time? BOK: We see a future for in-play messaging where the marketer no longer creates content for specific fixture based campaigns. Instead, all fixture messaging, across every sport is automated – fuelled by AI and big data, and marketers focus on optimising and fine tuning campaigns and content to maximise revenues. This means that as a consumer changes their betting behaviour not just through the week but also through a game, the type, content and way they receive messaging will be able to be automated and optimised to generate more relevance and ultimately more loyalty. 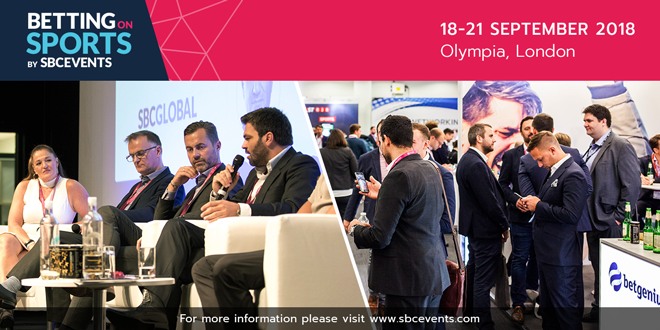 Betting on Sports is being held at the Olympia London from Tuesday 18 – Friday 21 September, encapsulating a number of events under one banner, such as CasinoBeats Summit, ESI London, Hall of Fame and Sponsorship Forum.